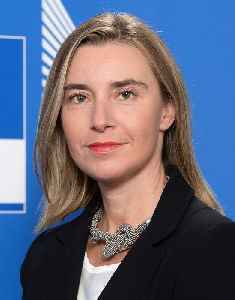 Federica Maria Mogherini is an Italian politician who has served as High Representative of the European Union for Foreign Affairs and Security Policy since November 2014. She previously served as Italy's Minister for Foreign Affairs and International Cooperation from February 2014 to October 2014, in the centre-left Renzi Cabinet. She was a Member of the Chamber of Deputies (MP) from 2008 to 2014.